When your home isn’t working well, it’s normal to feel stressed-out and worried. You wonder what has gone wrong, how much it will cost to fix it, and how much time it will take out of your already busy life. At Petri, we are here for all of your needs regarding plumbing, heating, and air conditioning in Canarsie and Flatlands, Brooklyn. We will help you out no matter what has gone wrong. At Petri, we believe in making a difference in people’s lives, one call at a time. We know that you don’t need any more stress and strain and that a home needing repairs can provide you with just that. We aim to take the stress away by using our expertise to solve your problems as fast and efficiently as we can. We’ll always keep the lines of communication open, too, so you don’t have to worry about surprises. We offer a comprehensive array of plumbing services, which is a fancy way of saying that we can handle all of your plumbing repairs in Canarsie and Flatlands, Brooklyn. We’ll get to you fast, take a look at the problem, then present you with our proposed solution. Once you sign off on it, we’ll get to work and have things back to normal for you fast. There’s no job too big or too small for our experienced plumbing staff. Whether you have a clogged drain, need a new water heater, or have a sewer problem, we’ll get the job done. We are also here for you 24/7. Plumbing problems don’t just happen when it’s convenient, so we will come to you anytime, any day (even on holidays!). When things get rough, we have your back. We’ll help mitigate the damage done to your home, then come up with a solution for the plumbing issue. You need both your heater and your air conditioner to work all year round in Canarsie and Flatlands, Brooklyn. It gets so hot and humid in the summer and so cold in the winter! We want you and your family to stay comfortable, no matter what is going on around you. To that end, we will get to you as soon as we can, figure out what has gone wrong, and make it right fast. If we have to order parts, we will keep you updated so you can make appropriate plans and know when your home will be comfortable again. If it’s time for a new heater or air conditioner, we’ll handle that for you, too. We’ll always tell you when it’s a better idea, financially, to replace a unit rather than repair it. When it’s time for heater replacement or a new air conditioner, we will look at the size of your home, how often you use your comfort systems, your budget, and any energy-saving preferences you might have. Then, we’ll make recommendations based on your needs and what we know of this business. We’ll always recommend units from manufacturers we would trust in our own homes. Once you choose your new system, we’ll handle ordering and installation. We’ll always stay until it’s all working right, too. Regular maintenance can keep both your heater and air conditioner working for years to come. We will not only change out your filters and clean your intakes, but we’ll also test the parts of your heater and A/C against the manufacturer’s specifications and repair anything that has broken or that isn’t working as well as it should. That way, you’ll save money on energy costs and you won’t have to replace these expensive units as often. We love helping out in Canarsie and Flatlands, Brooklyn and we would love to be your plumbing and HVAC company in that area. Call us whenever you need help with your plumbing, heating, or air conditioning and we’ll get there as fast as we can! Are New York’s first green plumbing company. Offer preferred scheduling to Petri Priority Customers. Have ongoing training to keep our staff professional and reliable. Are EPA approved Water Sense Partners. 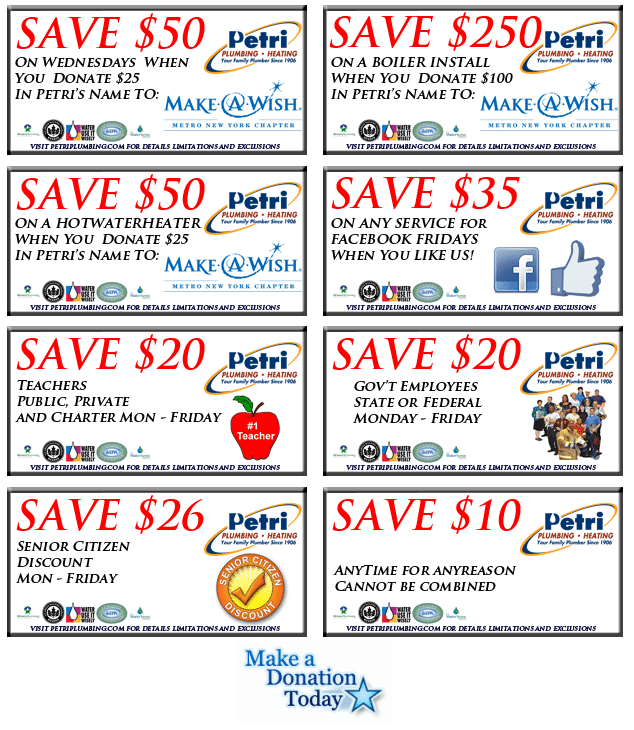 Reference the Plumbing Coupons below for savings on your service! For the best Canarsie & Flatlands plumber, call Petri Plumbing at (718) 748-1254.